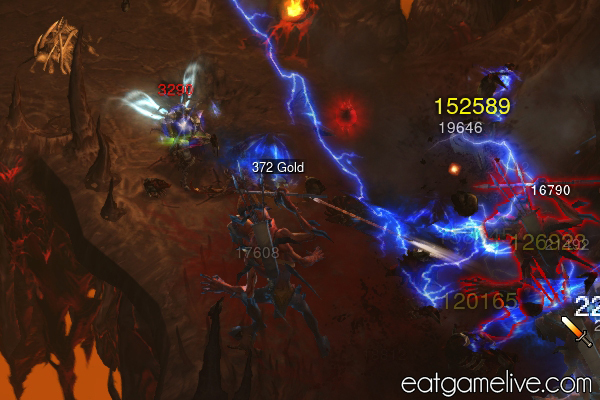 I’ve been playing a fair amount of Diablo III recently in a meager attempt to reach Paragon 100. Numerically, I’m more than halfway there; realistically, I’m about 25% of the way there. It’s going to be a long grind. It’s okay though — I’ve found some fancy stuff here and there. Legendaries seem to rain from the skies once you’re touting Paragon 50 and higher. Admittedly, most of them will tend to be not-so-excellent pieces of equipment. Thanks, RNG! I’ve hopped between several builds since the 1.0.4. Specifically, I used a multishot build with suppressive fire for quite some time. The build basically made my wrist incredibly sore from the amount of clicking and kiting required. So, I switched to a build similar to Pro Hacker’s DH. It seems to be working out a lot better and I’m completing runs much faster, but I’ll get into that later in the post. Before I nerd all over the place and make a mess, I should really get back to the matter at hand: food. I had a lot of bourbon left over from another recipe experiment, so I tried to put it to good use in this savory dish. Basically, I just poured a bunch of bourbon on a chicken for good measure. Yep. So, why is this dish called multishot chicken? Well, I’m just going to be blunt — there’s about a cup of booze in this dish. That’s roughly about 8 shots of bourbon all up in this chicken. MULTIPLE SHOTS. HA HA, GET IT? JOKES! …I am bad. 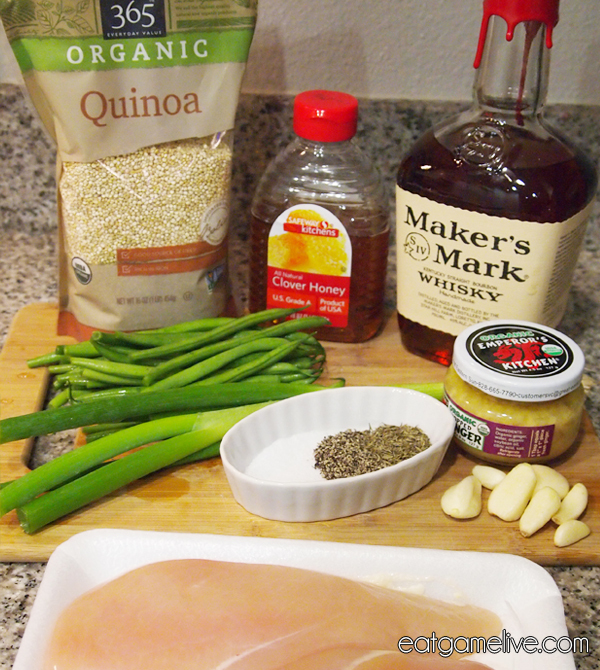 *If you would like this to be a booze-free dish, try substituting vanilla extract. Details here. Prep work should take about 20 minutes. Idle time will be at least 1 hour (for marinating). Cook time should be about 1 hour and 20 minutes. This will make 2 servings. Finely mince your garlic. Reserve half of the garlic for the beans. 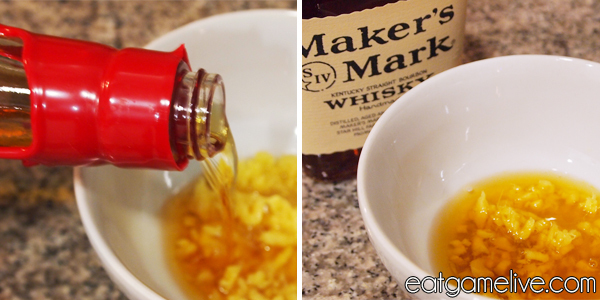 Combine bourbon, garlic, and ginger in a bowl. Add salt, pepper, and thyme to the mixture. Pour over chicken and allow chicken to marinate for at least 1 hour (over night is even better) in the fridge. Remove marinated chicken from the fridge. 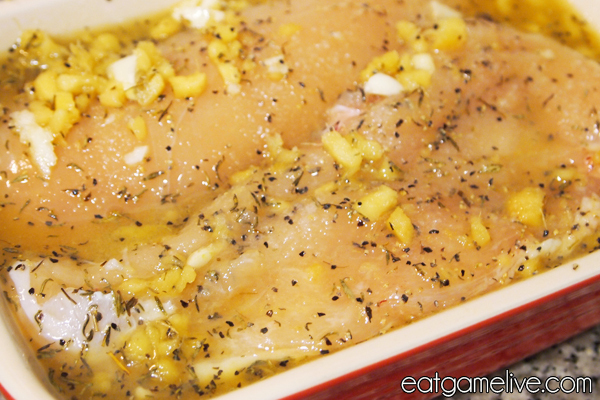 Place chicken and marinade in a baking dish. Bake chicken for 55 minutes. Allow chicken to brown under the broiler. When chicken is done, remove from oven and let cool slightly. Set 2 cups of water to boil in a pot. Add quinoa and a pinch of salt. Reduce heat to medium and cover with a lid. Quinoa should take about 15 – 20 minutes to cook. Place green beans in a skillet on medium heat. Add garlic, salt and pepper to the green beans. Add 1 tablespoon of water and set heat to low. French green beans should take about 5 minutes to cook. 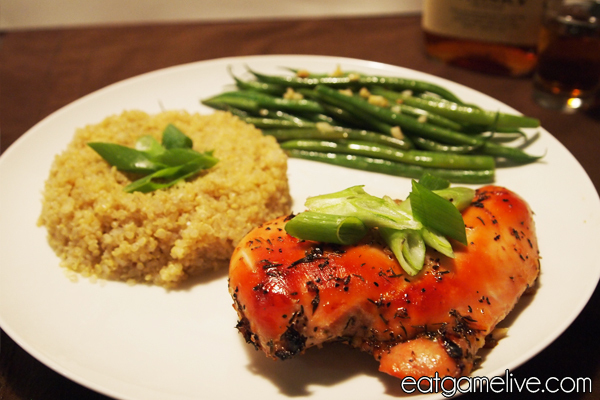 Plate chicken, quinoa and French green beans. OPTIONAL: Add chopped green onions to garnish. And that’s a GG WP for this drunken chicken. Now, go try out this dish and share it with your favorite demon hunter. I’m currently using a build that utilizes Elemental Arrow with ball lightning as the main damage output. The consistent crits from ball lightning subsequently replenish my discipline very quickly, and therefore, I can vault freely and gloom whenever necessary. It’s a great improvement over my previous multishot build and my wrist is no longer strained. Besides, ball lightning sounds MUCH cooler than multishot. bzzzzzt bzzzt bzzt bzzt. If you’re curious to about my full build and gear, here’s my b.net profile. *not an actual quote but close enough. 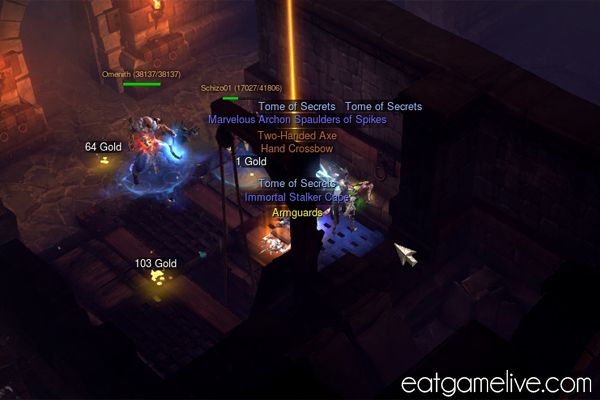 This entry was posted in diablo by admin. Bookmark the permalink. I assume the honey is used in the marinade? What happened with the honey?